Parking Permits Are a “Walk in the Park” with Our New Module! When it comes to parking, no two buildings operate in quite the same way. And that’s why we built our newly-released Parking Permits module to be really “smart.” It does the basics, of course, allowing your property to easily print and track parking permits for resident and guest parking. But then it gets interesting! Maybe your property allocates a specific number of guest parking permits to each unit/apartment per day, week, month or year. Maybe you charge a fee for each issued permit, or perhaps there’s only a fee for printing additional permits beyond a certain number. Maybe you have different types of permits for hourly, daily or weekend parking, with different expiration dates and different quantity limits and fees. Whatever your parking “reality” is, we’ve got you covered. Empower your residents, too! If issuing and printing permits is a headache for your staff, you can enable residents to conveniently issue and print their own permits on demand, 24/7, right from the Resident homepage. You’ll set the constraints and allocate the number of available permits to print; they’ll hit the ‘Print’ button. Voila! Everyone’s happy. Ready to get started? Take a look at our Parking Permits help page, or contact BuildingLink Support. By now you probably know that we’re obsessed with data control and security. So this time, we’ve really pushed the boundaries. While traditional software security provides just two dimensions—you decide who has access to what data—our new state-of-the-art security option adds a where component. This means that in addition to dictating who can access BuildingLink and customizing what information each person will see, you now have the option to restrict BuildingLink access to specific computers and physical locations you deem “Authorized.” Take control of your “where”! As you would expect, our new settings let you easily set different rules for different employees. Since BuildingLink is cloud-based, key employees can typically access building data from any computer or smartphone. So if your maintenance staff needs to record a work order on a personal laptop, or your manager needs to send an emergency broadcast from home, no problem! But for those employees who only need access to your BuildingLink data while they are on-site, you can easily protect your data’s privacy by restricting their logins to work only on certain computers, or even on specific iPads. Privacy controls for cloud computing have never been more powerful or precise. Now you can harness the power of device-authorization (typically used only by banks and brokerage firms) to create the data environment that works best for you and your property. Want to give it a shot? Check out our Authorized Computers help page, or contact BuildingLink support to get started. Have You Downloaded GEO 1.4? We’re excited to announce that we have a new version of BuildingLink GEO. 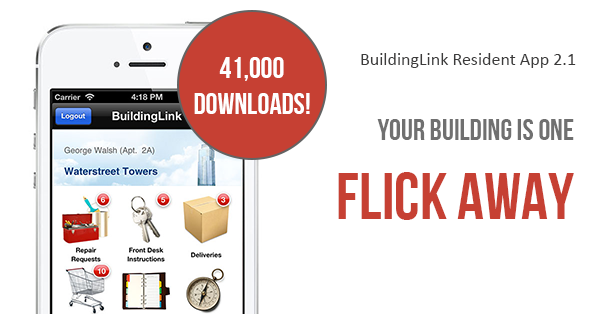 The popularity of the mobile BuildingLink app has pushed along some big updates. The app is faster and more responsive than ever. We’ve also updated it on the back end. We’ve reduced the amount of data that has to be downloaded during the day which means less wait time and more productivity. If you haven’t already downloaded version 1.4 of the BuildingLink GEO app for iPhone, iPad, or iPod Touch, click here for download instructions or simply update the app if you already have an older version. Still don't know about GEO? FInd out what you're missing! Click here or contact BuildingLink Support.